Few Chiefs or Sheriffs can think of any news in their profession that is worse than hearing that one of your officers or deputies has died. It is a tragedy that tears at every emotion, yet the affected agency head must still be able to move quickly to assist the officer’s immediate family as well as the law enforcement family to which we all belong. Lack of timely action by the Chief or Sheriff, or worse, inaction; will have long lasting consequences for the police leader as well as the agency itself. 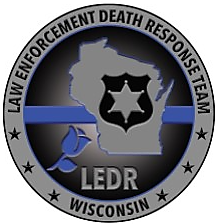 It is for these reasons that a group of law enforcement and affiliated professionals formed the Wisconsin Law Enforcement Death Response (LEDR) Team in 1999. Knowing that most agencies would be overwhelmed by a line-of-duty death, the Team was formed to assist agencies suffering any kind of police death, whether in the line of duty, suicide, or off-duty. Dealing with these deaths in the close knit police community goes far beyond extending sympathies and helping to arrange a funeral service. The Wisconsin LEDR Team has put together this guide for at least two reasons. The first is to give Chiefs and Sheriffs a “How-to” guide that shows all of the details that need to be addressed when a police officer dies. The second, and maybe the most important, is to show the enormous responsibility that falls to the Chief or Sheriff after a tragic event. He or she must act within minutes to begin to stop the trauma to the survivors: the family, friends, and co-workers of the deceased officer. Too often, Chiefs, Sheriffs, and other command staff personnel may feel that they “can handle it” when an officer dies. They may even have a policy covering “Line-of-Duty Deaths” to which they can refer. We, on the LEDR Team, ask that you consider accepting the assistance that will be offered when the news reaches us. Often, a more objective view is helpful to be sure that the family’s wishes are paramount and that nearly every conceivable detail is covered. The Chief or Sheriff will have enough to do keeping the department functioning and serving the family personally. The LEDR Team can help from the beginning with proper notification, logistics, staffing, and critical incident debriefings, to the important particulars concerning benefits, officer memorials, and follow-up. The LEDR Team’s role is to assist law enforcement agencies by working in concert with agency staff to be sure that the family is served, making sure that their wishes for their loved one are carried out. In addition, the LEDR Team serves the officer’s agency by coordinating peer counseling, debriefings, shift coverage, and other logistical details. We honestly hope this information will never have to be used by you or your agency. However, if the time should come where you will be called upon to make incredibly difficult decisions, please know that the volunteers on the LEDR Team stand ready to assist in any way possible. A LEDR Coordinator can be reached though any Wisconsin State Patrol Dispatch Center. Please follow us on Facebook for notifications and additional resources.